Nandini Ramakrishnan looks at the upside and downside risks to the UK economy and the unpredictable path of sterling. The need for the UK to achieve a transitional deal that will protect UK trade with Europe is mounting. Economic growth has already started to slow this year. Given the upside and downside risks to the UK economy and the unpredictable path of sterling, a neutral stance on UK equities seems sensible. While we do not have enough conviction to take large size or sector bets, active management at the stock level should still add value. The UK’s unemployment rate has fallen to just above 4%, which is the lowest since 1975. 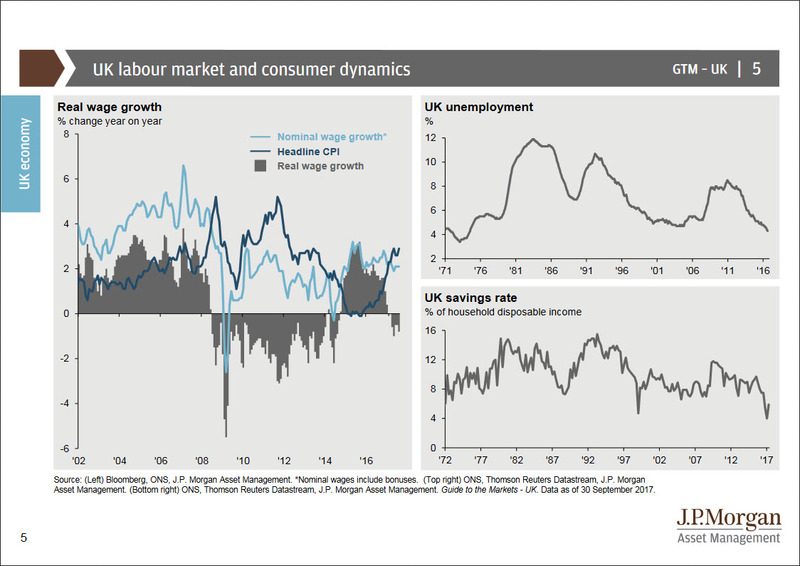 A tightening labour market is clearly beneficial for UK consumers. When unemployment is low, wage growth typically accelerates, but this hasn’t been happening recently. In addition, because of the weak pound, inflation near 3% is wiping out the 2% nominal wage growth, resulting in negative real wage growth. With real wages shrinking, consumers have been saving less. A lower savings rate has been helpful for the economy in that retail sales and consumption in the UK held up better than they otherwise would have done in the months immediately after the fall in sterling. However, savings rates can only go so low, and the recent decline has reduced the UK consumer’s ability to withstand any further economic shock. UK households are saving less of their disposable income. The UK economy is 60% consumption, which means the UK consumer is key for the nation’s economic prospects. Consumers tend to reduce spending if they aren’t feeling confident. We have already seen a sharp dip in consumer confidence, which could have a negative impact on more domestically orientated companies that rely on UK consumption. The UK economy is quite sensitive to the housing market. If house prices go up, consumers tend to feel more confident. 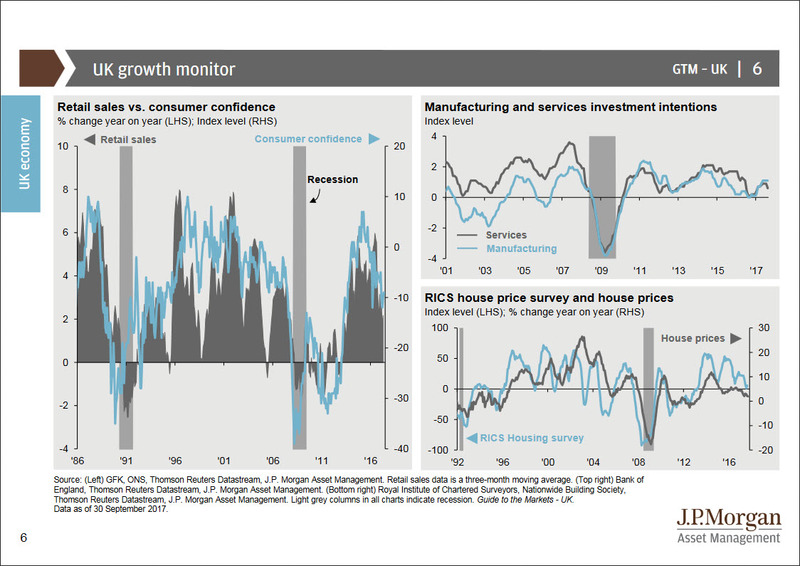 In recent months, both the RICS survey of house prices and the growth rate of UK home prices have weakened. Of course, UK businesses have a large role to play in the economy as well. Investment intentions surveys for both manufacturing and services companies took a hit last year, but have since recovered. If these intentions translate into actions, then UK business investment could help to support growth. The Bank of England estimates that quarterly growth in business investment will contribute 0.5% to GDP growth over the next quarter. A bounce back in investment intentions has been welcome. Large capitalisation multinational companies listed in the UK, the FTSE 100, source nearly 70% of their revenue from abroad, which means when sterling falls, these companies’ stock prices tend to rally. After the UK’s referendum on EU membership in June 2016, sterling fell dramatically and the FTSE 100 rallied, providing some of the best equity returns in local currency for 2016. 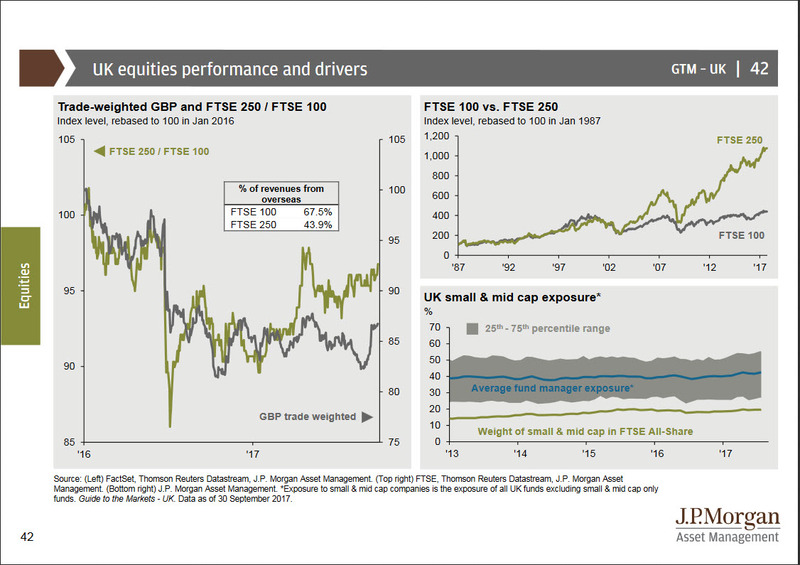 The more domestically focused mid and small cap stocks should outperform if sterling rises. Essentially, if investors knew the path of sterling, this could inform their view on small and mid caps versus large caps. UK fund managers have had a large bias towards small and mid cap UK equities over the past few years, which has paid off handsomely. In fact, the average weight of an all cap UK equity fund to the small and mid cap space is above 40%, whereas the benchmark weight of small and mid caps in the FTSE All Share is only about 20%. This means that the average UK equity fund is about 20% overweight to small and mid caps. At a time when so much uncertainty surrounds the domestic economy, this is a very large bet. As such, it probably makes sense to hold a small and mid cap weighting closer to the benchmark. A positive for investors in UK equities is the fact that UK companies pay high dividends. UK equity dividend yields are about 4% for the FTSE All Share. This is notably higher than the dividend yields on offer in the U.S., Japan and Europe. Mid cap equities have rallied far more than large cap since the crisis, but can this continue? The UK consumer and UK businesses face a murky outlook. Real wages are shrinking, and Brexit will eventually pose challenges for certain industries and companies even if a transitional deal were to delay these challenges. Lack of clarity on the outlook for the economy and sterling means staying neutral on large versus small and mid caps probably makes sense. Within sectors, however, some companies will still be better poised to navigate through the uncertain outlook environment. Finding income from UK equities is a good way to dampen the volatility in potential price fluctuations. Please be aware that this material is for information purposes only. Any forecasts, figures, opinions, statements of financial market trends or investment techniques and strategies expressed are, unless otherwise stated, J.P. Morgan Asset Management’s own at the date of this document. They are considered to be reliable at the time of writing, may not necessarily be all-inclusive and are not guaranteed as to accuracy. They may be subject to change without reference or notification to you. JPMorgan Asset Management Marketing Limited accepts no legal responsibility or liability for any matter or opinion expressed in this material. The value of investments and the income from them can fall as well as rise and investors may not get back the full amount invested. Past performance is not a guide to the future. Nandini Ramakrishnan is a global market strategist within J.P. Morgan Asset Management's Global Market Insights Strategy Team. She is responsible for communicating the latest market and economic views in the UK and around Europe.